Place the door’s top Z-bar (or rain cap) at the top the door-frame and secure it loosely with one screw. Decide which way you want your storm door to open and attach the hinge side of the Z-bar to the side of the door you want to swing. Position the door in the opening and assess the length of the Z-bar. If it’s too long, measure and use a hack saw to trim it down, cutting it on a slope to the outside. Place the door back in the opening and push the hinge side flush up against the jamb. Use a level to make sure the door is plumb. Secure both the inner and outer sides of the hinges to the jamb using screws and a drill. 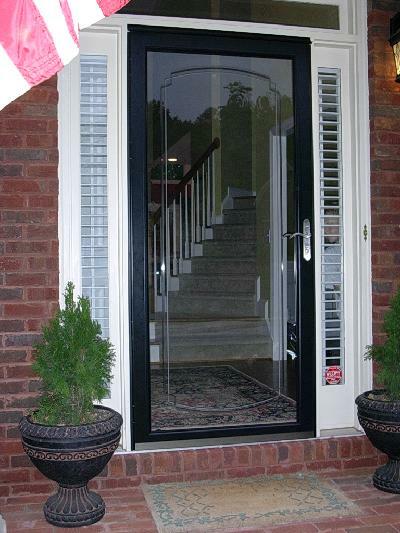 Adjust the top Z-bar so that the gap between the bar and the top of your storm door is even. Then, make sure that it’s width matches the door frame’s width. If it’s too long, use a hack saw to trim it. Then, secure it with a second screw. Place the handle-side Z-bar on the opposite jamb and secure in place, making sure the gap between the bar and the door is even. Attach the door’s handle and hardware according to the manufacturer’s instructions. Slide the door expander off of the door and measure the sweep to make sure it’s the same length as the expander. If it’s not, trim it accordingly and install it into the expander. Secure the expander to the bottom of the storm door using screws and a drill.